Well, here we are at the end of 2010! The year seems to have lasted such a long time, and we have done such a lot, both together and individually. From the start of the year in Paris with friends of Cat’s, to the end of the year back in snowy Bristol, via weddings, a funeral, a new baby, trips abroad for both of us, and all the little things that make up daily life. There have been friends galore, weekends at home and weekends away, birthday parties, engagement parties, hen and stag dos, weekends curled up on the sofa doing nothing, trips to the theatre and to gigs, paintballing and gokarting for Pete, and even performing (in Cat’s case) at the university dance show in March. Cat has qualified as a dance teacher and is now teaching jazz classes to students at Bristol University, Pete has been on one training course with work and is set to go on another in January. Cat has been up to Tymawr at vaguely regular intervals to visit her mum, and Pete has been up to Yorkshire to visit his parents and friends, and to Edinburgh a couple of times to visit his brother, including playing in a charity 7-a-side football tournament (in the group of death!). Pete spent 5 days in Sweden, Cat took 3 weeks to visit as many people as she could manage on both sides of the USA. Cat has been involved in volunteering at Greenbelt, visited the Scillies with her sister, was confirmed in September, and took part in a surprise 60th birthday party for Pippa, who is officially ‘home’ when visiting Lincoln, in the summer, while Pete represented us both at the wedding of two of our friends. The Rage Against The Machine free concert at Finsbury Park was undoubtedly one of Pete’s highlights of the year, a band he has wanted to see live for a long time now. If you ask Cat, though, she’ll tell you there were too many highlights to label one, but the weddings and new baby are pretty high on the list! We keep in touch with various family and friends – Cat’s Dad drops by when he visits Bristol with work, Pete’s parents pop in on their way to and from the ferry to France, Mair drops in at random (but well-planned) intervals – although she is now in Africa with Cat’s godmother, the first stop of a round-the-world trip, and Cat pops back to Lincoln when she gets a chance to catch up with the friends there. Cat’s Grandad sadly died in February, but he died quickly, with an overnight hospital stay (thankfully, he didn’t suffer – he would have hated being ill!). And it has brought other family home, one of Cat’s cousins has moved his family back from France into Grandad’s house, and we hope to see more of them in the future. We hope, wherever you are and whoever you are with, that you have a blessed Christmas and a very happy New Year, and perhaps (we hope) we will see you sometime soon. 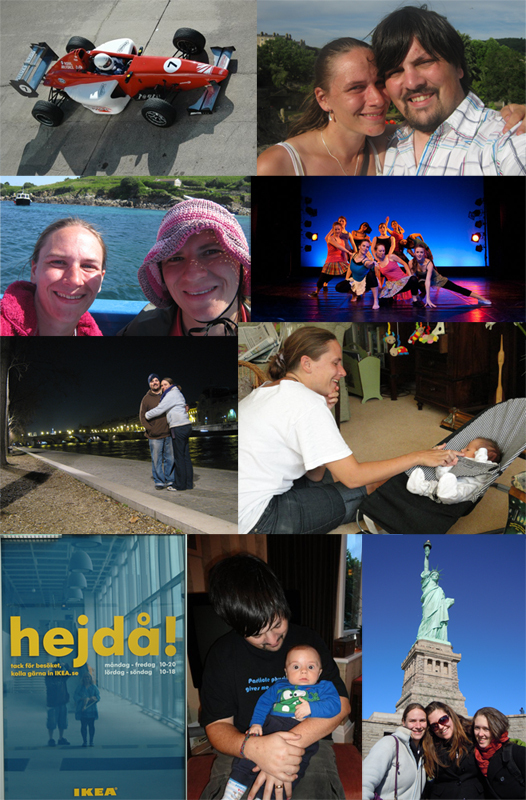 Photos from 2010, clockwise from top left: Pete at Silverstone, Cat & Pete in Bath for friends’ wedding, Cat in ‘Hairspray’, Cat meeting baby Matthew, Cat & friends in New York, Pete meeting baby Matthew, Pete & Tessa in Sweden, Cat & Pete in Paris and Cat & Mair in the Scilly Isles.